Almir Kapic has become a national example in Bosnia of what an underdog can achieve with hard work despite the odds. As the crowd cheered and clapped from the stands, Almir Kapic collapsed to the ground in the arena, unable to fight back tears. 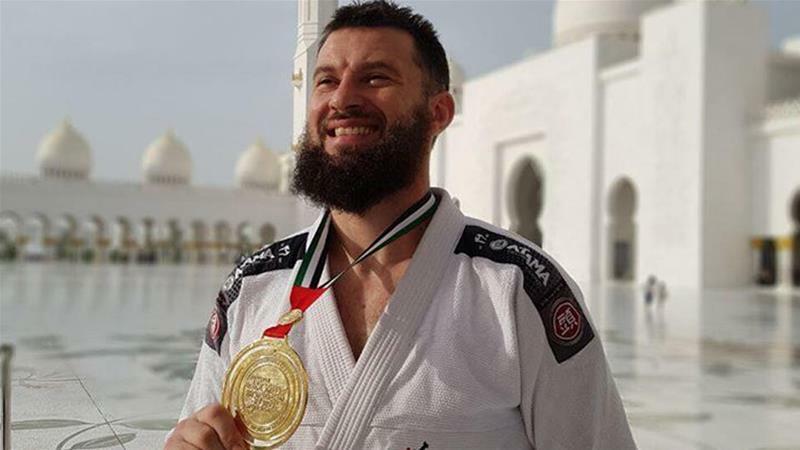 The 38-year-old Bosnian had just come out on top to be crowned Ultra Heavyweight champion in the brown belt division at the World Professional Jiu-Jitsu Championship, held last month in Abu Dhabi. Standing on the podium, Kapic was ecstatic as he proudly held up the Bosnia and Herzegovina flag. “I couldn’t believe it … I started to cry from happiness,” Kapic told Al Jazeera of his win. The gruelling training and years of perseverance and sacrifices had finally paid off. For the martial artist, it’s been a long journey to the top of the world. Hailing from the small town of Banovici, Kapic’s earliest years were marked with a struggle to survive as a bloody war ripped Bosnia apart in the early 1990s. He was just 13 when his father was shot and killed by a Serbian sniper during the nearly four-year war. Left with his mother, he recalls having to line up as a child to receive food donations from the Red Crescent. Food was often so scarce, many would consume leaves from the ground in order to survive. “We were fighting to stay alive; to exist,” Kapic said. It’s up to you to work and to try to be positive and progressive. Results for those who try will eventually come. That spirit of defiance stayed with Kapic throughout his sporting career – and helped him overcome many hurdles. In Bosnia, there is little state funding and official support for athletes like Kapic. In order to train daily, Kapic and other Brazilian jiu-jitsu practitioners rent out a private space in Bosnia’s capital, Sarajevo. Inside the 80 square metre facility, the floor is covered in two centimetre-thin tatami mats, unsuitable for jiu-jitsu, a sport which mostly takes place on the ground as it requires fighters to fall on their backs and knees. Due to the unprotected surface, the athletes often sustain injuries. But that’s not where the problems stop. In order to get to the latest competition in the capital of the United Arab Emirates, Kapic’s friends pitched in to help him financially. “Bosnia and Herzegovina is a country where many things are in disarray – legally, socially and even for sports,” said Kapic. Fuad Mujovic, Kapic’s strength and conditioning coach, said the challenging conditions are just part of every day life. “We’re not the type of people who complain about not getting anything,” Mujovic told Al Jazeera. “We got a lot [the gold medal in Abu Dhabi]; something that you can’t buy with money. The whole training process is demanding and gruelling, full of sacrifices but that’s something that goes along with sports. They say there’s one rule – train hard so that you can win easy”. Kapic’s trainer for the past three years, Mujovic describes him as “extremely diligent, studious and disciplined”. “His distinctive advantage over others I’d say is his intelligence and persistence that often borders with stubbornness,” he says. When he is not in the gym, Kapic, who speaks Arabic after studying in Egypt and Syria, works as a book translator. A devout Muslim, he also holds online Quran classes for students around the world. Ten years ago, Kapic graduated from the renowned al-Azhar University in Egypt’s capital, Cairo with the title of ‘Hafiz’ – someone who has memorised all 6,236 verses of the Quran. He says he draws strength as an athlete from his faith. In July, Kapic will be heading to Rio de Janeiro, Brazil to receive his master belt from the Gracie family – a top martial arts family known for their development of Brazilian jiu-jitsu. Since his win in Abu Dhabi, Kapic has become a national example of how an underdog can defy hardship to achieve success. Addressing Bosnia’s youth, he said: “It’s up to you to work and to try to be positive and progressive. “Results for those who try will eventually come. 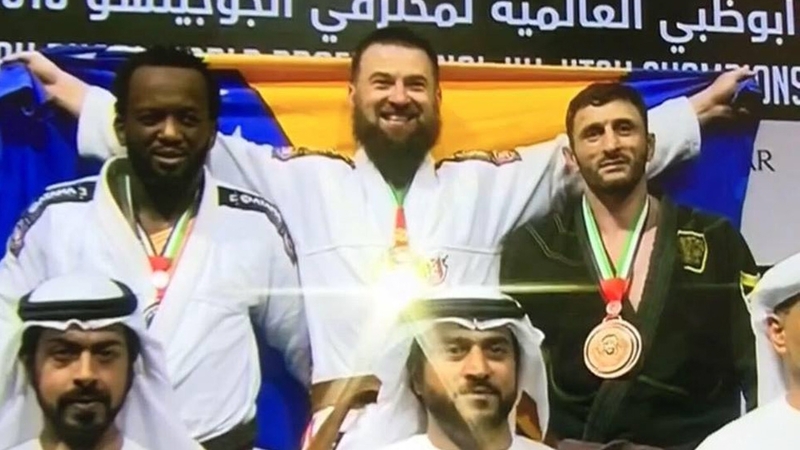 Proof of this is the years-long preparation that led to this result in Abu Dhabi, where we faced against stronger countries, stronger fighters but the medal still went to Bosnia and Herzegovina,” added Kapic.